I have teamed up with Shoretees.ca again to bring you an amazing giveaway! Shoretees is a small custom apparel business located in Hamilton, Ontario. They do everything from custom t-shirts to embroidery and beyond. They can handle big orders from companies as well as small orders from individuals. Shoretees also offers great pricing with no minimum order and no setup fees. I use Shoretees for many of my printing needs. I love the work they do so much that my other small business, Little Rebelz, collaborated with Shoretees in late 2016 to bring Santa Sacks to thousands of Canadians. 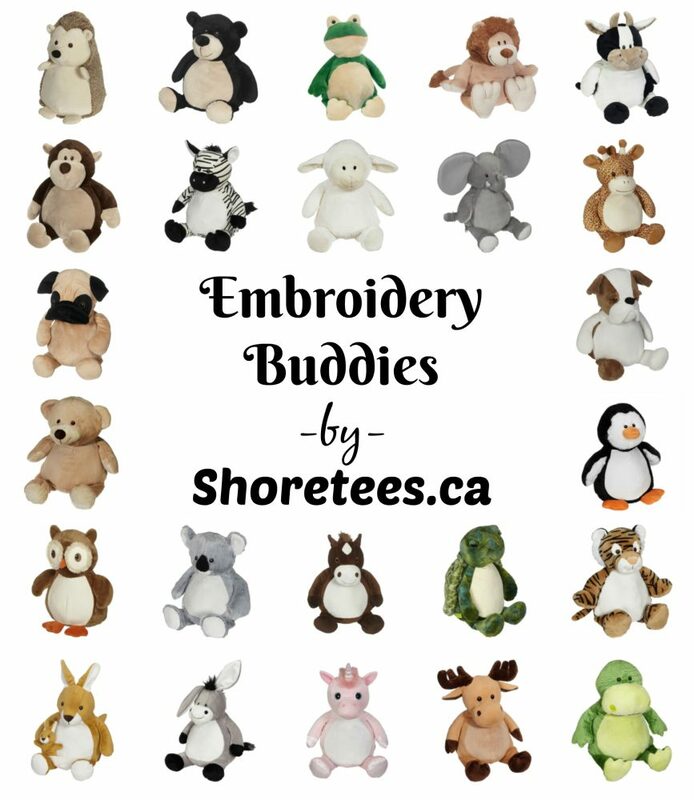 Embroidery Buddies are super soft and are 16″ in height. They have a removable stuffing pillow so you can easily wash the outer shell. You can have anything you want embroidered on your buddy. A child’s name and birth date or full birth stats is the most common. Embroidery Buddies exceed all applicable U.S., Canadian, and European safety standards too! Want to place an order for an Embroidery Buddy? 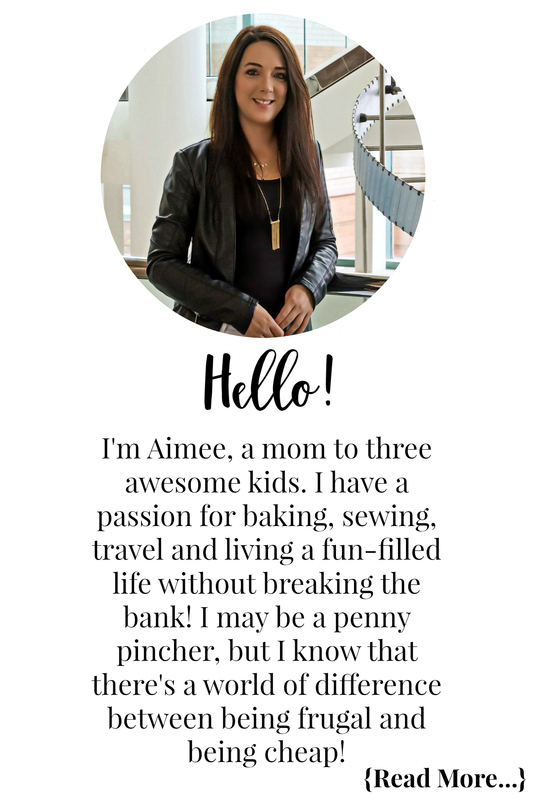 We have a SPECIAL discount code for Extreme Couponing Mom readers. Visit the Shoretees.ca website and enter code EB20 to get 20% off your order. If you have any questions you can contact them via Facebook or their website. Use the giveaway widget below to enter to win an Embroidery Buddy. The giveaway is open to Canadian residents who are 18+ and ends on March 31, 2017. You must complete the mandatory entry. Once completed you will have some additional entry options. Complete all the entry options to better your chances of winning. On April 3, 2017 a winner (or winners – see below) will be drawn from all eligible entries. The winner will be contact via email and will have 48 hours to respond. If the winner does not respond a new winner will be drawn. MORE PRIZES TO BE WON!!! 1 extra Embroidery Buddy when Shoretees on Instagram reaches 500 followers. 1 extra Embroidery Buddy when Shoretees on Facebook reaches 1500 followers. 1 extra Embroidery Buddy when Shoretees on Instagram reaches 1000 followers. 1 extra Embroidery Buddy when Shoretees on Facebook reaches 2000 followers. There is a possibility to have FOUR extra winners, FIVE in total of an Embroidery Buddy! The more you share the contest, the more people will enter. « First Time Mom? Trust Philips Avent Single Electric Breast Pump! I really like the owl. I would embroider my son’s info on it! I would get the giraffe. My friend is about to have her rainbow baby so I would have her baby’s stats on it as a keepsake gift. I’d love to win on for my daughter! Not sure which one I would pick yet, but I would most definitely get her birth stats. Hope I win. Looks so beautiful, would love to win for my nephew. I’d get either the elephant or giraffe because those are the two themes I have for my babies. I really like the hedgehog. I think I’d get the lion, and have my little grandson’s name and birthdate put on it. I’d love to win one for my daughter and another for our baby on the way! I would get the frog for my oldest and a bear for baby to be. I’d love the elephant or the monkey for my son Tristan! I would get the lamb with birth stats on it! Fingers crossed 😉 good luck everyone! I would choose the Lamb and I would have my granddaughter’s name on it and the lamb’s “birthdate”. I’d really love owl 😊 They’re my husbands fav! I would choose the giraffe, I think, but I don’t know what I’d put on it yet. I would love to win the owl for my son and have his name on it. The moose! We love the outdoors and this suits our growing family. Shoretees is an amazing local business! I would love to win the lamb for my daughter and have her name and birth date on it.Thanks for the chance. I would get the frog and have lines from my son’s favourite poem embroidered on it. My girlfriend is expecting her first baby in April. Her nursery is owl themed so I would choose an owl and include his birth stats. I would get the unicorn with my granddaughters name on it. I would pick the unicorn and write my daughter’s info on it!! I would get it for my neighbour who is expecting and I would get the name and birthdate! I would choose the lamb or the penguin – so cute! I love the hedgehog. I would put one of my daughter’s names on it….just have to figure out which one. I would chose the owl with my daughter’s name. These are so cute!!! Would love to win the owl! 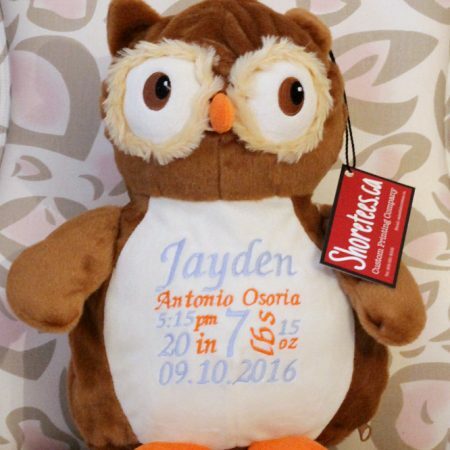 Love the owl with my grandson’s birth info , thank you for the chance. I love the donkey!! I would get my youngest daughters birth information on it for her as a keepsake!! There are so many cute options it’s so hard to choose! I’m torn between the monkey or giraffe for my lil guy! I would get his birth stats on so he can keep it as a keepsake! I’d get the kangaroo and have my niece’s name on it! I think I would get Duncan Donkey, he is sooooo cute!! I would choose Howie Horse Buddy. I would embroider a congratulations sentiment. I would get Hedley Hedgehog Buddy and I would get it for my 19 year old son. Really. He collect plush critters and this would be awesome. Thanks. I would get the moose and embroider my nieces info on it. I like the Unicorn and would get my daughters name on it. I would choose Owl, looks cute! I would get a dog, as my sister in law breeds dogs and has a second child coming this fall. I’d get it for my niece, though, with a message about becoming a big sister. I think the other kids may be a little forgotten in the time of a new baby and it’d be something special for her to have. They are all so cute, it would hard to pick just one. I would love a lion or a penguin for my girl, with their name, date, time of birth and her weight and length at birth. The Dino Dinosaur Buddy is so adorable, (my grandson absolutely LOVES dinosaurs, and calls them “dinos” so this stuffie would be perfect), so this would be the one I would choose for him. I would like to have my grandson’s name, Oliver, Love from Daddy and Grandma, embroidered on it. These are so cute. I would choose the peguin, my daughter loves them and I would get her info on it. I think I’d choose the hedgehog and give this to my niece with her birth information embroidered on it. I would luv to win a unicorn for my 2nd granddaughter. I’d get the Elford Elephant Buddy and embroider my daughter’s name, birthdate and information on it. I would choose the lamb and put my niece’s/goddaughter’s info on it. I think I would choose the turtle and get a friends baby’s info on it. Thanks for the opportunity! They are all cute but I would get the hedgehog for my brother who is about to have his first child. He is obsessed with hedgehogs. I would have the baby’s info put in it. 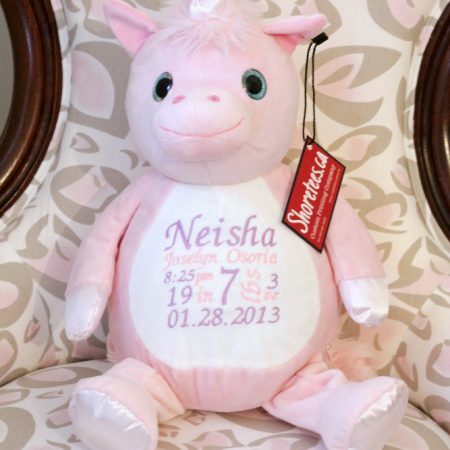 I love the unicorn and would love to win it for my 2 year old daughter with her birth info on it! I would get the dinosaur, my daughter is obsessed, and I would have her birth stats on it. I would likely let my daughter choose (likely the unicorn♡) and put her name and birth info on it. Thanks! I would choose the lamb and have ‘My Beloved’ embroidered on it.